A Runway Change, particularly once the aircraft has begun to move under it’s own power, can be a profound change to implement on the flight deck. If you sit on the flight deck in cruise, look around and consider the worst sequence of runway change – say from a long runway away from terrain and weather, to a shorter runway in a different direction towards terrain and weather – then roll your eyes over all the switches, buttons and knobs in the flight deck and all the FMC CDU pages and entries as well – there are dozens (at least) of potential changes required to action a runway change. All while taxiing for the new runway (not a good idea) or while stopped on the taxiway, blocking aircraft behind you (otherwise know as collateral damage). Oh, and you’re burning fuel (about 2000 kg/hr) at this point as well, I hope the runway change was towards your destination, rather than away from it. In looking at all the changes required on the flight deck – did you miss the biggest one? The Pilots. Each pilot develops during pre-flight a mental model of the Departure, including aspects of aircraft movement across the ground and through the air, configuration during takeoff and what will be required to change that configuration airborne, direction of turn, acceleration, noise abatement, speed and altitude control and other more subtle aspects of the departure. In the midst of what can be quite frankly the chaos of a runway change on the run – you’ll need to re-build that mental model as well. Often it’s easier to get the plane to do the right thing after a runway change than it is to update the pilots on the full implications of the change on the flight. Preparation for the expected runway and the associated development of a mental model is accomplished during pre-flight in a sequenced, logical, time pressure free flow (I know it doesn’t always seem that way …). Each time you depart, the majority of actions performed during pre-flight that relate to the specific runway are performed the same way each time, and runway specific items are not separated out from that process. We never set the flight deck up, calculate and cross check takeoff data, complete the Departure Briefing, then the Pre-Flight and Before Start Checklists – then finish of by doing all those items only related to the runway. Preparing for runway is integral in the pre-flight process – which is why determining the changes that must be made when the departure runway changes can be such a challenge. In my previous company I was fortunate (?) to experience many runway changes. We flew a higher number of sectors each month, runway changes were, well if not common place, at least regular. As a line pilot, particularly a First Officer, I never gave it a great deal of thought – you just did what had to be done. When I moved to the Left Hand Seat, I had a number of encounters which altered my world view. I suddenly found I was managing a runway change, rather than actioning one – and that made all the difference in the world (how many times has that been said by new Captains about 12 months after they upgrade …). Eventually I developed for myself a Runway Change Procedure and stuck it on the back of my Clipboard. After that, every time I was subject to a runway change – whether on stand or approaching the runway – I reviewed it. Over time it grew a little, but it hasn’t really changed for quite a while. When I commenced Training for my previous airline, it became even more useful. For some reason as a line trainer, I seemed to attract runway changes (more related to the nature of the multi sector flying than a personal vendetta by ATC, I hope …) and whether Cisco or Pancho (or Diablo) on the flight deck – I would pull it out and use it after making the change. My little checklist made it onto many other pilot’s clipboards as a result, and if you line trained with me in those days, there was always a lively discussion in cruise about runway changes. As an aside – I have never been a fan of preparing more than one runway for departure. I would often see command training candidates, seeking to be prepared for any contingency on departure, who’d would prepare for multiple possible runways on departure. This would include the use of Route Two and preparing takeoff performance data for the possible runway change(s). Usually only two were involved – the planned runway and the most likely change. I see that practice regularly now with Abu Dhabi and occasionally Los Angeles and Sydney. In that particular instance we had one runway in the FMC, a different heading set on the MCP, and we’d briefed on the third possibility, with speeds and takeoff performance entered for a fourth (it’s amazing what you can achieve on a distracted flight deck during pre-flight) before I called a halt to the exercise and we started again. Some days you were just never meant to push back on time. When I arrived at my present company I was fortunate to inherit the responsibility of establishing the aircraft SOPs. While I stuck as close to Boeing as I was comfortable with (accompanied by input from an extensive review of several other international 777 operator’s SOPs) I made sure that my little runway change procedure (above) was inserted into the Normal Procedures for the 777. 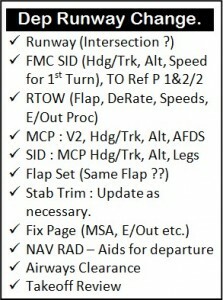 During the few runway changes I’ve had, I’ve used the checklist. From discussion over the last few weeks, many other pilots have as well, contrasted with some of our pilots who have never seen it. Personally I now find with so little flying, it’s become indispensable, although clearly, I’m biased. Owing to recent events, we are re-evaluating that checklist and moving it to a more accessible location on the flight deck (well, more accessible for others, it will stay in my clipboard for me). As part of that re-evaluation I reviewed updated documentation for several airlines and found that Delta and United both have similar a procedure. Focussed primarily on the FMC and impacted by their own specific type of performance limits – our new one certainly incorporates anything I’ve found in other airlines. The version below is a draft only and subject to approval, but hopefully we’ll see it soon in print. Certainly it’s availability in a more accessible form will highlight it’s existence to crew who are subject to runway changes in future. What is yet to be determined is how it will be used. Going on my own practice, I typically work as a crew to implement the change and cross check the work done by the other pilot – then just as everyone agrees all is done, I drag out the checklist and verbally review the items, getting assent from the other crew at each item before continuing down the list – effectively, a done list. In fact when you review the documentation below, it’s something of a hybrid between a procedure; procedural guidance – and a checklist. Thinking about it – I would prefer crew continue action runway changes as they always have – by relying on experience and the recent familiarity they have with the pre-flight process that’s brought them to this point. Chances are crew will do the best job of thinking of all the items they should – the checklist should be used as a follow up to catch the items that might otherwise cause a safety issue. A crew make dozens of entries, selections and decisions during pre-flight that are tied to a specific runway and the departure direction associated. In addition a complex mental model which includes terrain, weather and procedural implications is established by briefing and other thought developing processes. All of these are typically accomplished through practiced, familiar processes that happen in sequence and are the result of learned, practiced behaviours. 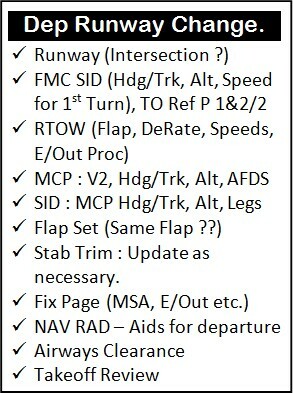 While most of these changes are mechanical in nature and can be the result of a checklist – such as the Runway Change Procedure shown here – more complex is the development of a pilot’s mental model of the taxi, takeoff and flight departure. This can generally only be achieved – particularly across the flight deck – by repeating/updating the Departure Briefing once the changes have been determined, evaluated and implemented in the flight deck. Often the first indication of a previously unknown runway change is the direction of pushback in the push/start clearance. In this case the most appropriate response is usually to cancel push/start, remain on stand and action the change. While this can result in an OTP departure delay, it results in a better change action with less time pressure on the crew to accomplish what needs to be done. Once the aircraft has begun to move, the recommended response to a runway change is to find an appropriate place for the aircraft to stop so all crew can be involved in the procedure. While relief crew can perform some useful preparation for a runway change during taxi, PF and PM should be fully engaged in ensuring safe taxi of the aircraft, rather than actioning a runway change procedure while the aircraft is moving. The Final FMC Performance Entry procedure must be actioned in full no matter how small the changes involved in takeoff performance – from ZFW verification through to MCP and VNAV Climb Page Altitude/Fuel Checks. 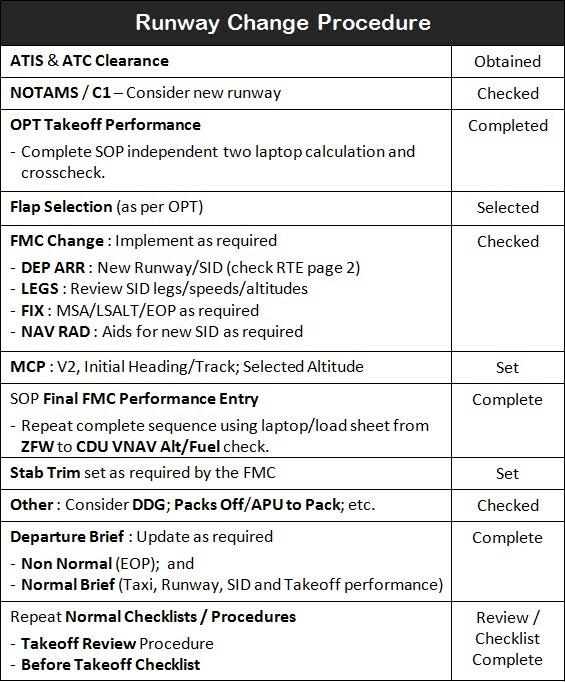 Once the Departure Briefing is updated the Takeoff Review and Before Takeoff Checklist must be completed (or repeated if necessary).